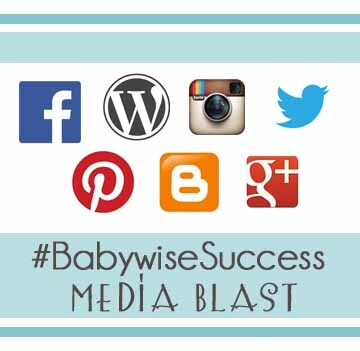 Babywise Success Stories Week–Social Media Blast! It is Babywise Success Stories Week! Time to share our success with the world! My goal with doing this week is for us moms to openly share what we love about Babywise. No need to hide or keep it quiet. We don’t need to be pushy or in people’s face, but we can share good news about it–people share things they love all the time!. I hope that moms considering Babywise will find these stories and get real stories from real people. I want to try something new this week. I want to spread the word through social media! We can tag it and label it to make it easy for moms to find. Here are some ideas. Your stories will be running all week on this blog. If you don’t want a story on this blog, or did but haven’t turned it in, you can write on on your blog and post it. If you want other Babywise moms to find it easily, you can comment on this thread with a link to your published story (I will remove spam links if they pop up). If you want to share you love Babywise but don’t have a lot more to say than that, try tweeting it! Share your message and include the hashtag #BabywiseSuccess. If you want to @ me (@valplowman), I will retweet them on my twitter page. Wouldn’t it be fun if we could get #BabywiseSuccess trending? I have two ideas for you on Facebook. You can either update your status this week to share about your success with Babywise, or you can share your success on my Chronicles wall on Facebook. You can also share a success story you love on Facebook. You can pin something from my site, or repin something from my Chronicles board. You can also pin something about Babywise that you love from any other site! Recommend on Google! Share a story you love (share your own story if you have one running this week). I have a confession. I haven’t ever used Instagram. It is my next social media avenue to embark on, but I haven’t gone there yet! So from what I know (the little I know), you can hashtag there. SO–share a photo or video of your babywise success and #BabywiseSuccess it. Blanket time? Independent playtime? Nap time? Picture of a clock showing early bedtime? Just a cute picture of your cute kid? You can easily share any blog post through email, blogger, twitter, facebook, or google+ through buttons on the bottom of any post.